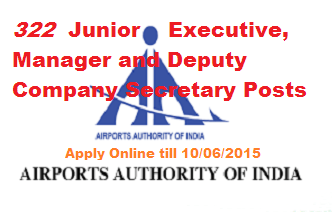 aai.aero AAI Recruitment 2015 – Airports Authority of India (AAI) has issued notification for the recruitment of 322 Deputy Company Secretary, Deputy General Manager, Manager, Junior Executive vacancies. Airports Authority of India (AAI) invites application from eligible candidates to apply online through AAI’s website www.aai.ewro for the following posts. Eligible candidates may apply online for Step-1 of Online Registration on or before 11-05-2015 & Step-2 of Online Registration on or before 20-06-2015. other details on AAI Recruitment Notification 2015 regarding age limit, education qualification, selection process, application form, how to apply is mentioned below.